US President Barack Obama yesterday concluded the Nuclear Security Summit in Washington, involving more than 50 countries, with a bland statement highlighting his presidency’s supposed achievements in limiting the spread of nuclear weapons. 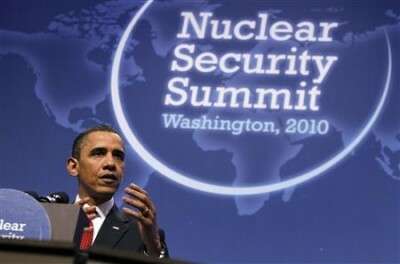 In reality, the Obama administration has greatly heightened, not lessened, the danger that nuclear devices will be used. The summit was held under the banner of the “war on terror,” with the supposed purpose of engendering international collaboration in preventing Al Qaeda or Islamic State of Iraq and Syria (ISIS) gaining access to nuclear weapons. “There is no doubt that if these madmen ever got their hands on a nuclear bomb or nuclear material they most certainly would use it to kill as many innocent people as possible,” Obama declared. The greatest danger confronting humanity, however, is not that ISIS or Al Qaeda will obtain and use nuclear weapons, but rather that the madmen in the White House have recklessly inflamed flashpoints in the Middle East, Eastern Europe and Asia, setting the stage for a catastrophic conflict between nuclear-armed powers. So acrimonious are relations between Washington and Moscow that Russian President Vladimir Putin refused to attend the summit. On the eve of the gathering, the US military announced that by February 2017, it plans to maintain a “permanent footprint” of three armoured brigades in Eastern Europe in NATO countries bordering Russia. In the Middle East, using the pretext of combating ISIS, the US and its allies are engaged in a dangerous confrontation with Russia to oust Moscow’s ally—the Syrian regime of President Bashar al-Assad. The potential for a military clash was underscored last November when NATO ally, Turkey, shot down a Russian aircraft that allegedly intruded briefly into its airspace—a provocation undoubtedly sanctioned by Washington. The absence of Russia from the summit highlights its fraudulent character. The US and Russia together hold 90 percent of the world’s nuclear bombs—a huge arsenal of around 10,000 warheads in service—making a mockery of Obama’s “vision of a world without nuclear weapons.” The aim of Washington’s “non-proliferation” policy is not to rid the globe of nuclear bombs but to ensure the US retains its dominant position over any potential rival, including Russia. The White House’s chief focus at the nuclear summit was on China. When Obama met with his Chinese counterpart Xi Jinping on the sidelines on Thursday, the tensions were palpable. In a comment in the Washington Post the previous day, the US president flagged “North Korea’s continued provocations” as “unfinished business.” While China and the US agreed on the denuclearisation of the Korean Peninsula, Xi “firmly opposed” the Pentagon’s plans to base a Terminal High Altitude Area Defence (THAAD) system in South Korea. Since coming to office, Obama has stymied any resumption of six-party talks to eliminate North Korea’s weapons and facilities. Instead, he has repeatedly exploited flare-ups on the Korean Peninsula to justify the US military build-up in South Korea and Japan, as part of its broader “pivot to Asia” against China. Despite US assurances to the contrary, the anti-ballistic missile system is primarily directed against China, not North Korea. While the constant drumbeat from Washington is about the “threat” posed by China’s military expansion, the US has overwhelming superiority in the sophistication and size of its nuclear arsenal—some 5,000 warheads in service, compared to an estimated 260 for China. Moreover, while promoted as a defensive weapon, the THAAD system is part of the Pentagon’s efforts to achieve “nuclear primacy” over any rival. Unlike China, the United States has never ruled out a nuclear first strike. The THAAD systems are to ensure any Chinese weapons that are not destroyed in a pre-emptive US nuclear attack can be shot down before reaching any American targets. Xi and Obama also traded diplomatic blows over the South China Sea. Before their meeting, US officials again accused China of “militarising” islets under its control and warned against any declaration of an Air Defence Identification Zone (ADIZ). On Wednesday, Deputy Defence Secretary Richard Work branded an ADIZ as “destabilising,” saying the US would not recognise it. In 2012, the Pentagon flew nuclear-capable B-52 bombers into the East China Sea after Beijing announced an ADIZ in that region. The rising instability in the South China Sea is a direct consequence of the actions of Washington, which has encouraged countries like the Philippines and Vietnam to aggressively press their maritime claims against China. Over the past year, the US has repeatedly condemned China’s land reclamation and “expansionism” in the South China Sea. On two occasions—last October and again in January—the US dispatched US navy destroyers to conduct “freedom of navigation” operations within the 12-nautical-mile territorial limit around Chinese-administered islets. This week, the New York Times provided another example of propaganda posing as journalism, with first-hand accounts from an embedded reporter on board a US navy cruiser in the South China Sea. The on-the-spot reporting made clear that US military encounters with Chinese forces are now routine in the South China Sea. Each of these encounters poses the danger of a miscalculation leading to an armed clash and a wider conflict. The New York Times article on Thursday, entitled “Patrolling disputed waters, US and China jockey for dominance,” reported a conversation overheard two weeks ago between Joint Chiefs of Staff chairman, General Joseph Dunford, and Admiral Harry Harris, commander of the US Pacific Command. “Would you go to war over Scarborough Shoals [reefs claimed by China and the Philippines]?” Dunford asked. The reply was not heard. Whether the answer was yes or no, the fact that two of the US military’s most senior commanders were casually discussing war with China is revealing in itself. Moreover, there is an inherent logic to Washington’s escalation of tensions in Asia. Were the US to refuse to back the Philippines over the Scarborough Shoals, or Japan over the disputed Senkaku/Diaoyu islets, or South Korea over an incident with North Korea, the whole web of US alliances in Asia and internationally would be called into question. It is this underlying dynamic, notwithstanding Obama’s posturing at the Nuclear Security Summit, that poses the very real danger of a nuclear war.